A serpentine-shaped façade seamlessly blends the richness of the past with the relaxed sophistication and adventurous attitude of the present. 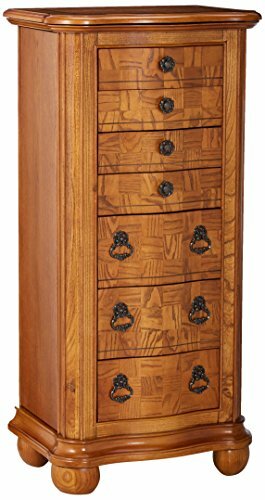 The Porter Valley Jewelry Armoire has curved drawers with Ash Burl faces. The flip top has inset mirror and reveals top compartment with half ring pads, half open area. The 1st small drawer has 9 squares, the 2nd small drawer has 4 squares, and the 3rd small drawer has 4 rectangles from front to back. 4th small drawer and 5th, 6th, and 7th large drawers are open and fully lined in 100-percent rayon Black Lining. There are 2 side pocket doors with lined interior each with 2 rows of 5 necklace hooks. . Finished in a casual and luxurious, Distressed Oak, with white Ash Burl and Walnut inlay. Fully assembled.